Bootloader Files – bl39.bin & bl46.bin. Firstly, update your iPhone’s firmware to 3.1.3 using iTunes. Create a folder on desktop and name it as ‘RedsnOw’. Download iPhone 3.1.2, 3.1.3 firmwares and redsn0w. Also, download Bootloader Files – bl39.bin & bl46.bin. Save all the downloaded files in this folder. Now, connect your iPhone using the USB cable. 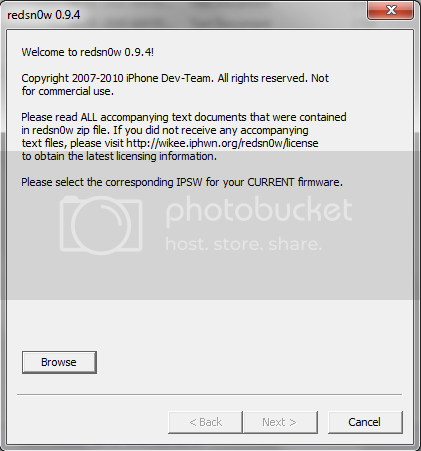 Start RedsnOw, browse the 3.1.2 .ipsw firmware file from the folder and click on ‘Next’ to proceed. If you want to unlock the iPhone then select ‘Unlock’ option from the window. Make sure you also select ‘Install Cydia’. Once done, click on ‘Next’ to continue. A bootloader window will appear, perform the instructions given on the screen. The redsnOw tool will automatically start the unlocking procedure. Just wait for few minutes to get your iPhone unlocked.